This feature puts a converter in a special mode that enables the device to loop back the signal from the RX port to the TX port on either media for testing and troubleshooting purposes. 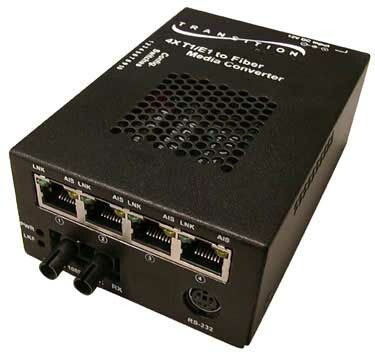 4x T1/E1 Transport Mux remotely-managed media converters are capable of transporting multiple T1/E1 lines, 10/100 Ethernet and an RS232 Data Channel over a single pair of fiber or a single fiber strand. The Transport Mux is designed to address the needs of FTTx, such as Fiber-to-the-Business, Fiber-to-the-Building, Fiber-to-the-MDU and Fiber-to-the-Home. With the remotely-managed converter, service providers are able to achieve significant cost savings within the network by limiting the number of fiber runs required and increasing the level of integrated hands-on management control over each link in the system.